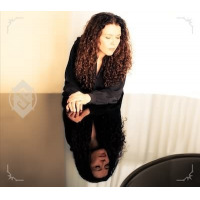 If you have a pigeonhole into which you would like to place pianist Sylvie Courvoisier's music, maybe stop reading right now. The Swiss-born, now twenty-year native of New York, apportions her many talents to multiple ensembles and musical stylessolo to large ensemble, chamber works, Downtown jazz, flamenco, European classical and improvisation. Needless to say, stagnant is an adjective that could never be applied to her music. D'Agala is her 11th release on Intakt and the second trio recording with veterans Drew Gress on bass and Kenny Wollesenon drums. It follows Double Windsor (Tzadik, 2014). 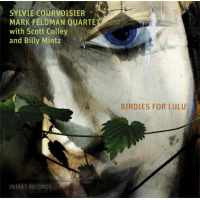 If you haven't followed Courvoisier of late, she's recorded impressive dates with Mary Halvorson, Nate Wooley, Ken Vandermark, Evan Parker, Chris Corsano, and Mark Feldman. If dropping those heavyweight names isn't enough to convince you not to typecast the pianist, this outing certainly will. The nine original compositions exhibit an almost wry sense of humor by injecting odd meters into a matrix of slanted swing and tilted complexities. The locomotive pulse of the opener, "Imprint Double," chugs along before derailing into some thoughtful woolgathering (not an oxymoron) of investigatory improvisation. The brief sojourn returns to the tracks and the trio travels forward. Credit not only the pianist, but Gress and Wollesen, for this audaciously interesting excursion. Both support the music through their acts of musical creation. Whether they chase, or are chasing, Courvoisier's Cecil Taylor-like rollicking sound on "Éclats for Ornette" or her two-handed keyboard dance heard on "Simone," they feed the sound with sizzling cymbal and brushwork and an arco and plucked pulse running commentary. Courvoisier's gift, expressed here, is a patience at the keyboard, and often inside the piano. On "Bourgeois's Spider," she pulls harpsichord-like notes from the guts before knocking a pulse on the wood frame. We're not talking free improvisation here, as every stroke is in service of her writing. Composition is the first priority in these pieces. The music has an urgency when called for, in "Circumbent" it's applied in fits and spurts, revealing an energy that is, without a doubt, deftly managed. The same is true for "Fly Whisk," in which (contradicting physics) energy is both created and destroyed. Yes, Sylvie Courvoisier's trio has that power, Mr. Einstein. Track Listing: Imprint Double; Bourgeois’s Spider; Eclats for Ornette; Simone; Pierino Porcospino; D’Agala; Circumbent; Fly Whisk; South Side Rules. 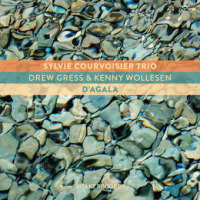 Personnel: Sylvie Courvoisier: piano; Drew Gress: bass; Kenny Wollesen: drums and Wollesonic.